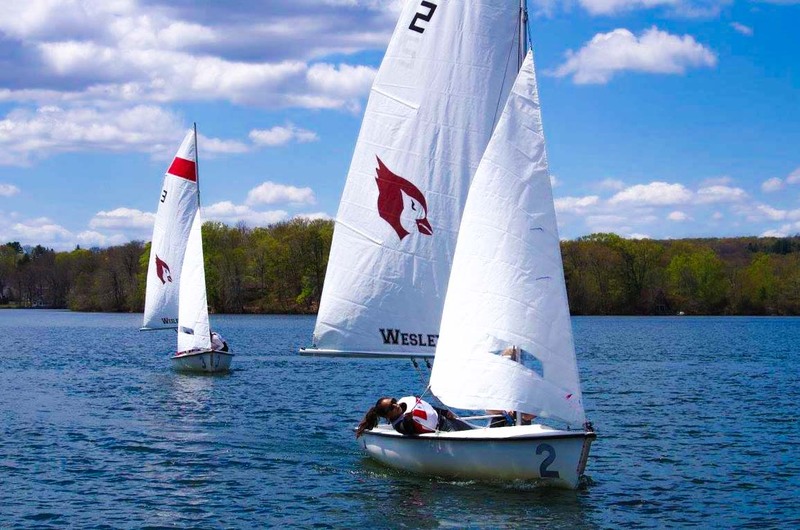 This past Saturday, Wesleyan sailing made a massive stride as a program by hosting its first-ever regatta, which took place in East Hampton, Conn. on Lake Pocotopaug. 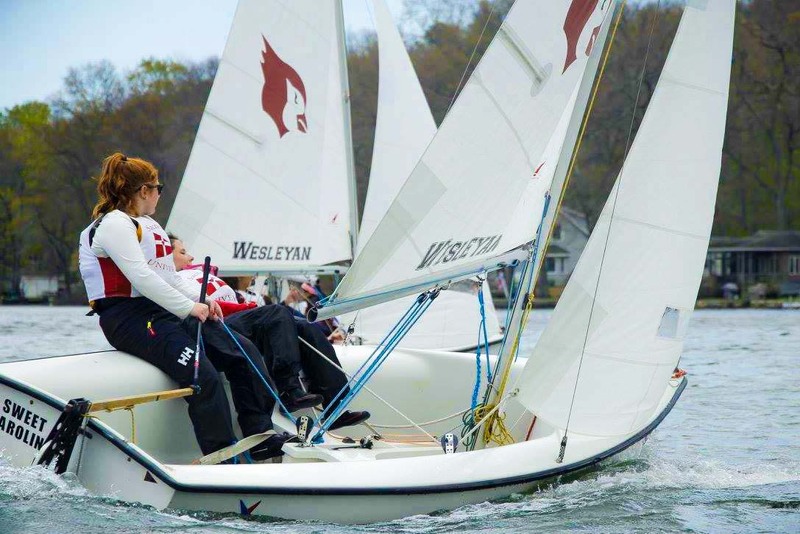 The team has competed every year in the New England Intercollegiate Sailing Association (NEISA), but had not hosted a regatta of its own until this spring. Winnie was joined on the two Wesleyan boats by Ali Dawes ’19, captain Rachel Kurlander ’16, and captain Katherine Walker ’16. Meanwhile, Jenny Chelmow ’19 and Carly King ’18 crossed over to sail for an underrepresented Sacred Heart side. Bates and Fairfield University rounded out the competition. The race initially began at 11:15 a.m., but the boats were called back when the wind died. Later in the afternoon, the wind picked up and the teams were able to sail a total of eight races. Though Winnie was more focused on the impact of hosting a regatta, the team also sailed to solid results. As of Monday, results were not yet released but it was clear that Wesleyan and Fairfield occupied the middle two spots, with Bates in first and Sacred Heart in last. The regatta would not have been possible without contributions from a number of non-sailing members of the program. “Shout out to our coach Scott Leppert, sailing alums Molly Haley [’12], John McGlynn [’13] and Earl Lin [’15] for serving as officials for the regatta and being great hosts,” Winnie said. The team has yet to reach its ultimate goals as a program, but is making great strides in that direction. The developments were encouraging for Winnie during his time at Wesleyan. Chelmow’s success was a particularly nice story of the event, as she is an inexperienced sailor who has made great strides during her time at Wesleyan. Chelmow, King, and Dawes will hope to use their experience to continue the team’s upward trend next season. Earlier this spring, the Cardinals placed 12/16 in a Harvard-hosted regatta, 6/10 in a regatta hosted by Sacred Heart, and 8/8 in a regatta hosted by University of Rhode Island. They also placed near or at the bottom of every regatta this past fall. Given this history, the middle of the pack finish this weekend certainly indicates an upward trend. The Cardinals will of course have their eyes on the ultimate prize: a first place finish. Wesleyan has not won a regatta since the fall of 2012 when they finished ahead of ten other teams at the Rhode Island Yacht Club. Unfortunately, “A”-boat racers McGlynn and Caroline Eisenmann ’12 are both gone, as are “B”-boaters Anges Page’ 12 and Lewis Fowler-Gerace ’15. Wesleyan’s young sailors will be forced to create their own legacy, a challenge they will face full steam ahead. Winnie expressed some sadness over having raced in his last regatta alongside his friends Walker and Kurlander, who also will graduate this spring. However, the seniors know that they are leaving the program in capable hands. The wind is blowing in the right direction for Wesleyan sailing. Katie and Rachel are not just Kevin’s friends, but also captains! “As of Monday, results were not yet released but it was clear that Wesleyan and Fairfield occupied the middle two spots, with Bates in first and Sacred Heart in last.” If they can’t get the results out in a 4 team regatta promptly after completion, they have a long way to go.